I made the classic mistake: I had high expectations to a movie based on something geeky, that I use a lot of spare time on... and I was led down - a bit. This movie really had potential. I mean not even the sky is the limit to what you would be able to put into a movie like this. I could have been a plot twisting in and out and massive tactical strikes on xenos of various kinds. Instead they made a classic mistake: narrowed it down to a straight line plot with no surprises and very limited exploration of the open world of Warhammer 40.000. It is not really a bad story, it just could have been so much more, and with the brilliant writer Dan Abnett behind it, I was really hoping for something amazing. In general the plot reminds me of a very simple one-off roleplay scenario played on one night. The characters makes the same mistakes as RPG players would have done, and their lack of control and discipline towards their commander and the Emperor just adds to this. These are not Ultramarines, as I think of them. 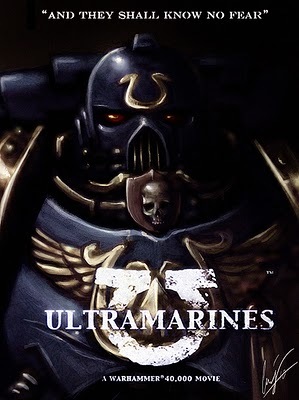 The next this is the Chaos Space Marines. Why are they so neat and clean? They are supposed to be really filthy and covert in sigils and symbols that hurt the eyes just to gaze upon. I am not impressed. It is my hope, that they are going to make many more movies about the Warhammer 40.000 universe, as there is an enormous potential crazy stories and fantastic effects. I just fear, that this poor start to the series might have doomed the whole project from the start. Lets hope not! If you are a fan of Warhammer 40.000 or just a general fantasy/sci-fi geek, you might enjoy this, but do not get your hopes up to high. If you are a Dan Abnett fan, I think you would be disappointed. This is simple plot-on-rail-road-tracks action animation. It is above average, but not good, in my opinion.